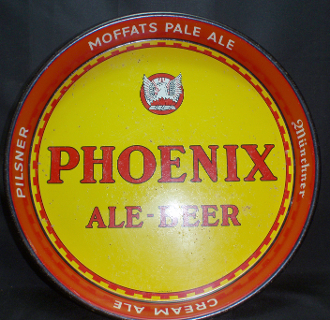 Phoenix Ale-Beer Tray.Phoenix Ale-Beer Moffats Pale Ale Munchner Cream Ale Pilsner all printed on the rim of the tray. Marked on the front bottom of the tray is A.X. Co. 71-A : 7. Tray definately saw some bar use with some scratches, dents and rust peppered throughout the tray. Tray has 13" diameter and 1 5/8" dept. Nice representative Phoenix Ale-Beer tray.